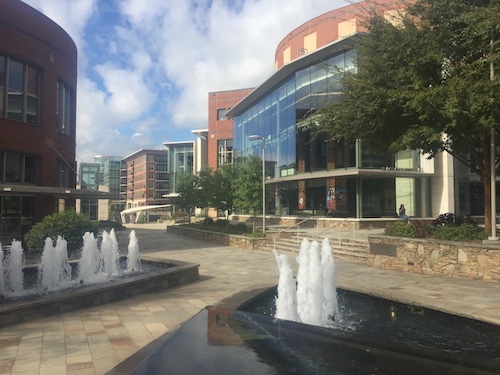 Home to a number of colleges and technical colleges, including Furman University and Bob Jones University, Greenville is a fast growing town in northwest South Carolina. Although about 50,000 people live in the city proper, the Metro area including Spartanburg is over 1 million. Greenville has an interesting downtown and several great neighborhoods. Downtown Greenville is home to many specialty shops and boutiques. The Haywood Mall is a major mall in the area. The downtown has been the subject of intense and successful redevelopment efforts. It won Great American Main Street awards from the National Trust for Historical Preservation in 2003 and 2009. Although unemployment is high currently, it does have a diverse industrial and commercial base with manufacturing plant including Michelin. It is host to several minor league sports teams including Drive. This is a thriving community for the arts. Photo of Falls Park courtesy of Wikipedia and CantoV. Greenville is a relative bargain. According to the NAR, the median sale price of a home was $231,000 in the 4th quarter of 2018 in the Greenville-Anderson-Mauldin area, although that would be higher in many active communities or upscale neighborhoods. Zillow's Home Value Index for Greenville was $186,900, in early 2019, and calls it a "Hot" market. Property taxes on a $200,000 home is about $1,100 to $1,400 in the area. Restored, award-winning downtown that is rated one of the best in the country. 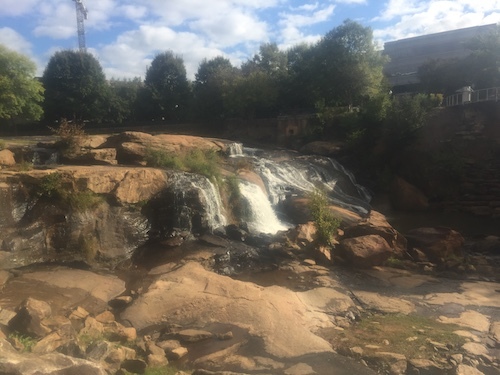 An expanding system of parks and trails along the Reedy River and the Falls goes right through the heart of the downtown - it is very unusual and beautiful. Many colleges and universities such as Furman. Wide diversity of neighborhoods to live in. Named as a great place to live by Money.CNN. Crime is higher than the US average but has been dropping over the last ten years, now a third less than in 2000, while the population in the area has been constantly growing. Traffic congestion is a growing problem. Woodruff Road can be brutal, especially on the weekend as this road is a major retail corridor. There is a bus system but many feel it is seriously underfunded. Go here for a critique of the public bus system. The crime rate is well above the U.S. average. Bon Secours St. Francis and the Greenville Hospital System serve the Greenville area. Greenville-Spartanburg Airport serves Greenville. There is AMTRAK service as well as bus service by the Greenville Transit Authority. Greenville has a "somewhat walkable" Walk Score of 52. The downtown area is extremely walkable for the many people who live there.